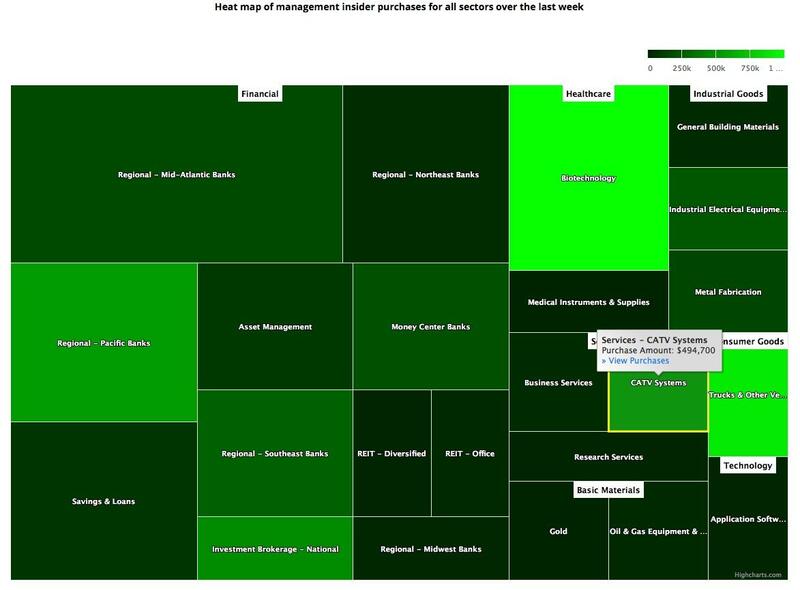 Notable Insider Buys: SNX, ASGN, IBTX, ODT, HY. Notable Insider Sales: MSFT, GRMN, TWTR, SRPT, GOOG. Insider buying increased last week with insiders purchasing $66.26 million of stock compared to $45.76 million in the week prior. Selling almost doubled with insiders selling $500.08 million of stock last week compared to $257.89 million in the week prior. Sell/Buy Ratio: The insider Sell/Buy ratio is calculated by dividing the total insider sales in a given week by total insider purchases that week. The adjusted ratio for last week went up to 7.55. In other words, insiders sold almost 8 times as much stock as they purchased. The Sell/Buy ratio this week compares favorably with the prior week, when the ratio stood at 5.64. Director Matthew Miau acquired 247,111 shares of this business services company, paying $79.32 per share for a total amount of $19.6 million. These shares were purchased indirectly by Silver Star Developments Limited. Director Edwin A. Sheridan acquired 20,000 shares, paying $65.33 per share for a total amount of $1.3 million. Mr. Sheridan increased his stake by 1186.24% to 21,686 shares with this purchase. SVP, Chief Legal Officer Jennifer Hankes Painter acquired 1,000 shares, paying $65.87 per share for a total amount of $65,872. Ms. Painter increased her stake by 6.66% to 16,019 shares with this purchase. Director Douglas A. Cifu acquired 10,000 shares, paying $54.79 per share for a total amount of $547,898. Mr. Cifu increased his stake by 31.62% to 41,621 shares with this purchase. Director John Webb Jennings acquired 4,500 shares, paying $53.89 per share for a total amount of $242,491. Mr. Jennings increased his stake by 12.43% to 40,706 shares with this purchase. Vice Chairman and CLO Brian E. Hobart acquired 3,700 shares, paying $54.19 per share for a total amount of $200,503. Mr. Hobart increased his stake by 3.16% to 120,624 shares with this purchase. Director William E. Fair acquired 1,100 shares, paying $54.43 per share for a total amount of $59,873. These shares were purchased indirectly by Fair Title, Inc. dba Hatco Investments. Vice Chairman and CRO Daniel W. Brooks acquired 1,000 shares, paying $55.71 per share for a total amount of $55,707. Mr. Brooks increased his stake by 0.92% to 110,008 shares with this purchase. Chief Executive Officer Kevin C. Tang acquired 39,765 shares, paying $15.35 per share for a total amount of $610,301. These shares were purchased indirectly by Tang Capital Partners, LP. Director Aaron I. Davis acquired 26,824 shares, paying $14.72 per share for a total amount of $394,753. These shares were purchased indirectly by Boxer Capital, LLC. Chairman Alfred M. Rankin acquired 15,009 shares of this lift truck manufacturing company, paying $61.35 per share for a total amount of $920,784. These shares were purchased indirectly through various trusts. Chief Executive Officer Satya Nadella sold 203,418 shares of Microsoft for $106.68, generating $21.69 million from the sale. We don't often see the CEO of Microsoft sell stock and this sale caught our eye. His prior sale was of 328,000 shares sold at an average price of $109.44 in August 2018 and before that he sold 143,000 shares in August 2016. This "old tech" giant, has seen its stock triple in value over the last five years compared to a gain of 83% for the Nasdaq. Despite the recent pullback, the stock is still up more than 24% year-to-date. Trading at 15 times EBITDA and sporting operating margins of over 32% while growing revenue nearly 19%, the stock appears to be reasonably valued. Guidance for the second quarter pointed to continued double-digit revenue growth and no significant pressure in margins. So one can only conclude that Mr. Nadella is just taking some money off the table after a tremendous run-up in the stock along with the rest of the market. Executive Chairman Min H. Kao sold 322,186 shares of this GPS manufacturer for $62.34, generating $20.08 million from the sale. These shares were purchased indirectly by Mr. Kao's children. Director Evan Clark Williams sold 682,242 shares for $28.73, generating $19.6 million from the sale. These shares were sold indirectly by various trusts. VP, Engineering Michael Montano sold 1,250 shares for $29.05, generating $36,312 from the sale. EVP, CFO & CBO Sandesh Mahatme sold 107,524 shares of this biotech company for $127.74, generating $13.74 million from the sale. 89,400 of these shares were sold as a result of exercising options immediately prior to the sale. CEO, Google LLC Sundar Pichai sold 10,000 shares of Alphabet for $1113.91, generating $11.14 million from the sale.